I haven’t posted a “What’s In My Bag” post in a long time, so allow me to share a few things that I’ve been toting around on a daily basis recently, along with the bag that I am currently using. Right now, I am using one of my dad’s travel bags as my everyday bag. 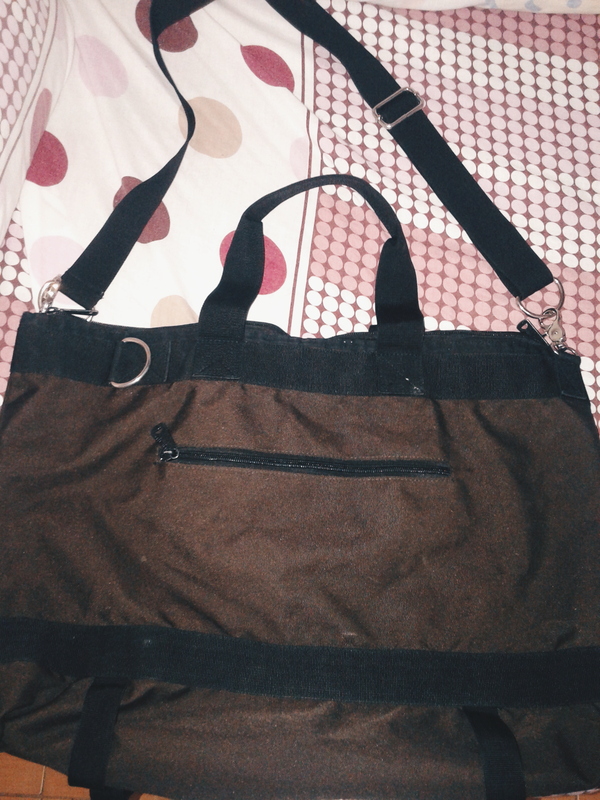 As you can see, it’s just a big, plain bag, but I love it so much because it can carry a lot of things, even cats. Haha! Seriously speaking, I really love this bag because it is probably the only bag that can house all my essentials while keeping them safe. As much as I love lugging around my eco-friendly bags, I can’t really carry it around town because it is unsafe, so this bag is also a good alternative. I don’t have the rest of the stuff inside my bag in the photo above, but I usually bring an iPad with me, in place of a laptop. Sometimes, I bring my laptop along with my iPad and cellphone, but it can get really heavy, thus straining my shoulder. Don’t get me wrong, I love big bags, but it can be quite exhausting to carry them after a long day! 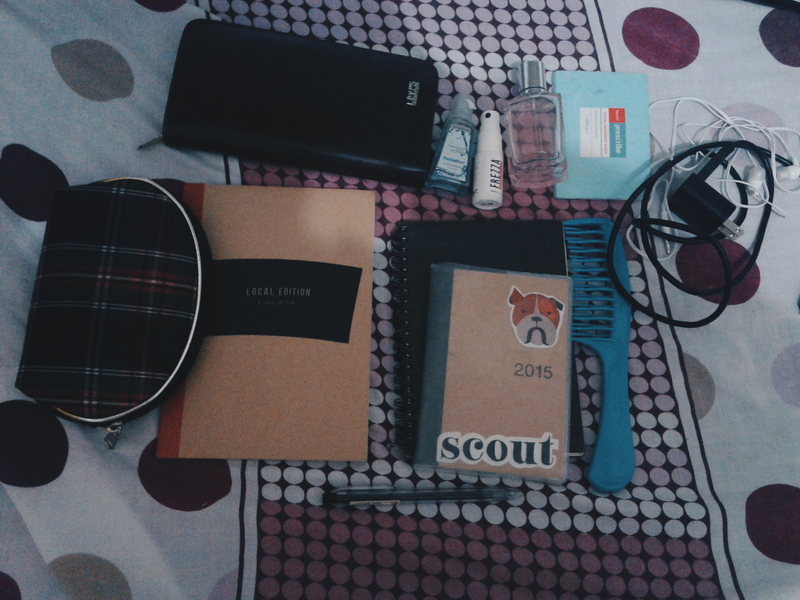 Aside from my gadgets, I always bring a few notebooks for journaling, as well as my planner, all of which are from Muji. I also bring a few essentials with me, such as my wallet, phone charger, and earphones. When it comes to toiletries and personal care, I always lug around a bottle of my favorite perfume from Zara, as well as a hand sanitizer and a breath spray. Last but not the least, I carry my makeup kit with me. I usually don’t carry a lot of makeup, but I always have at least two lip products in my makeup kit, along with a few makeup essentials, such as powder, concealer, and eyebrow pencil. I try to be as low-maintenance as possible with my makeup routine, that’s why I try to bring as little makeup as I can. And that’s it for my bag! I know my sartorial choices can be incredibly boring, but hey, I like a good functional bag. I have a confession to make: My Twitter feed is pretty active, but I have been neglecting my blog again, despite writing this post about trying to be more active in blogging after months of not posting. I am so, so, sorry. Anyway, the reason why I went lie low with my blogging is because real life happened (well, somewhat happened). I’ve been trying my best to spend less time on the internet, and I’ve been making an effort to engage in more real-life activities, such as applying for a job or learning how to cook. In addition to a few real-life activities, I’ve been taking management classes. I don’t want to say much about it, but after 10 days of learning different concepts in management (problem solving, decision-making, accounting, economics), I think I’ve got a fairly good grasp of how businesses work and how to manage these businesses. Aside from the technical know-how I picked up from these classes, I also learned a bunch of life lessons along the way, such as making decisions more systematically. Hmmm…what else? I have also been indulging a few movies and books, such as Ernest and Celestine, Avengers: Age of Ultron and Miranda July’s No One Belongs Here More Than You, respectively, while alternating alone time and hangout sessions with my friends. I guess I’m starting to embrace the ins and outs of real life instead of watching it unfold in front of my computer screen. Embracing and participating in real life also means not freaking out about things on social media and confronting life head-on. And to be honest, I am starting to like this transition.